When it gets warm outside I usually need a daily salad fix. 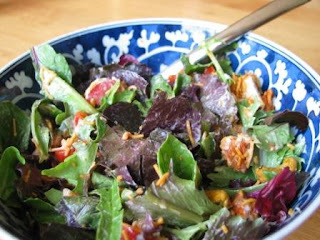 Over a period of time, I've developed my own salad with an Indian twist that I like to call a Bhel Salad. The idea is - you're eating a salad, but you vaguely feel like you're sitting at Chowpatty eating Bhaiyaji's Bhel. But without the added pasina. Start off with any good looking Spring Salad Mix. If you can get something with lettuce, red endives, rapini, arugula and beet leaves, you'll get a taste that you won't get bored of quickly. If you like a twinge of bitter like I do find something with dandelion leaves. Some pictures of the greens here to help you look for them. If you eat chicken, chop in a few pieces of cooked Tyson's Buffalo Tenders. Break and toss in a few Trader Joe's Thai Chili and Lime cashews. Cut some grape tomatoes in half and add. If you can't find grape tomatoes, just pick any tight-skinned ones (like say Roma) that won't get mushed when tossing. A pour of Maggi's Masala Chili Sauce for some heat. If you really love bhel you can substitute that with a mix of tamarind sauce (2 parts) and mint-coriander chutney (1 part) - which is a basic ingredient in bhel. A small pour of Hidden Valley Cracked Peppercorn Ranch dressing for some creaminess. Top it off with a small sprinkle of Haldiram's Alu Bhujia. Some more nuts are a great addition depending on your diet - especially pecans or walnuts. If you like a slightly sweet chewy twist, add in some raisins. You can vary the quantities of each item depending on how you like your bhel. I stay away from adding onions - out of respect for everyone around me - but knock yourself out if you like them. If you are very hungry, fill up a whole wheat pita with the salad. Damn! that sounds good. I'm not much of a salad fan but this I'm temped to try. Btw, you've been tagged! Indian writers/books you read or want to read. It's Monday - Happy birthday, Beth!